The sun was high and the track was hot Friday morning when Kurt Decker pulled up to the start line at the Texas Mile, full of nerves and adrenaline. Less than a minute later, Kurt set a new world record. 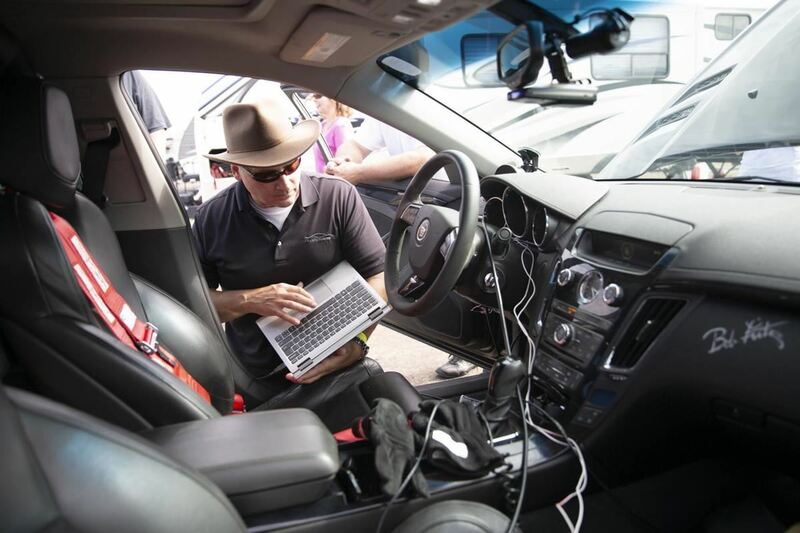 Event organizers said Decker, 42, set the new Cadillac CTS-V blower-only half-mile record at 177.5 mph and full-mile record at 212 mph on Friday. He is among many racers who enjoy pushing vehicles’ limits at the bi-annual Texas Mile event, held at Victoria Regional Airport. Decker, who owns LSX Performance Dyno Tuning in Mission Valley and works as a chemical engineer for Dow Chemical Company, said he has been coming to the Texas Mile with his team members since 2004, including Patrick Guerra, who tunes cars at his shop. The LSX Performance Dyno Tuning team is one of the few local teams that is at the Texas Mile this weekend, though Decker and Guerra have worked on many of the vehicles at the event. 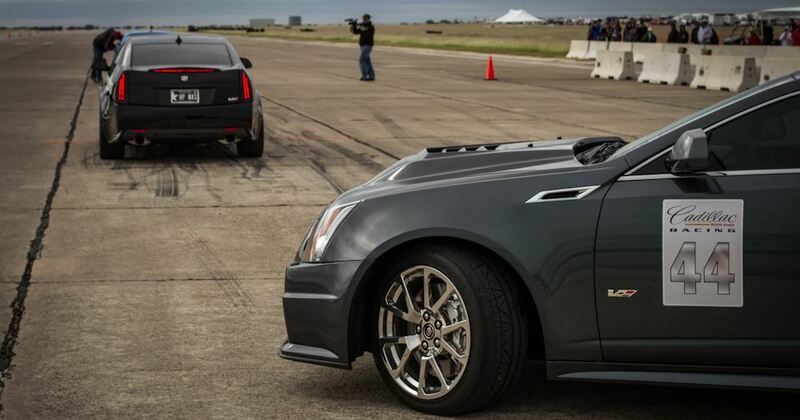 Patrick Guerra, of Pat G Tuning in Victoria, custom calibrates the ECU perimeters on Bruce Warren’s 2011 Cadillac CTS-V before Warren makes a run at the Texas Mile. This is the second time Warren, of Traverse City, Mich., has participated in the top speed event held at the Victoria Regional Airport. Guerra has developed a reputation for tuning cars over his years in Victoria. Currently, he said he tunes for 64 different shops across the country and sends them by computer to people around the world. “It went from part-time work for me to full-time work and tuning just for Kurt’s shop to now tuning for 64 shops,” Guerra said. Shannon Matus, co-owner and CEO of the Texas Mile, said the three-day event originally started out as a small get together with friends. As the event has grown, Matus is glad to say that the competition has remained friendly. “It isn’t like it is in drag-racing. It is competitive but you help one another, and it is very family-oriented,” Matus said. On Saturday Kurt reset the CTS-V blower only 1/2 and 1 mile record. 143.5 in 1/4, 178.6 in the 1/2 and 213.6mph at the mile. Names in "bold" are Cadillac V-Club members. Congratulations to all competitors! Are you ready for the Texas Mile? Check out this video!